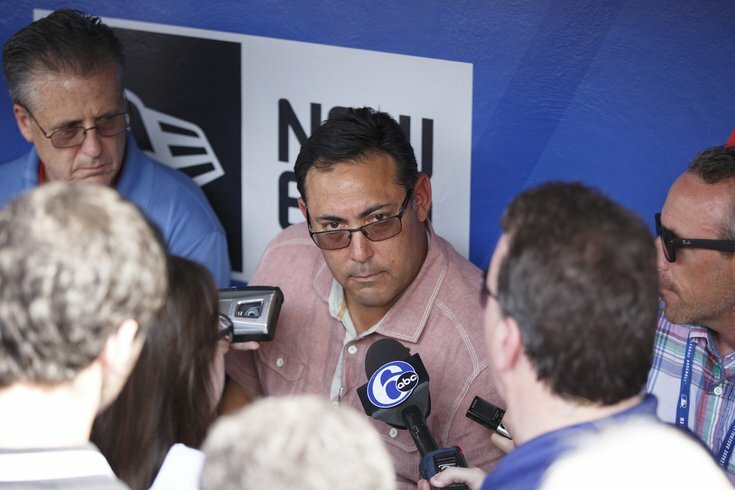 Phillies GM Ruben Amaro meets with the media prior to Monday's game against the Rays. Considering their top pitching prospect -- this may be one of the last times we can call Aaron Nola that -- will be making his MLB debut on Tuesday for the Phillies, it wasn't all that surprising when general manager Ruben Amaro decided to chat with the media prior to Monday's series opener against the Rays. In a wide-ranging convo that had as much to do with the health of some current players as it did with the promotion of Nola, Amaro started by dropping some news regarding injury-plagued starter Chad Billingsley, who made just his seventh start of the year, and fourth since returning from the disabled list earlier this month, in Saturday's 3-1 win over the Marlins. He was removed in the fifth inning of that game with what the team described "elbow symptoms." On Monday, Amaro announced that the 30-year-old righty will go on the 15-day disabled list with an elbow injury, a move that was made following the Phillies' 5-3 win over the Rays. "Billingsley is going to be going on the 15-day DL," Amaro said. "We’ll have a roster move. It may be the one that involves Aaron [Nola]. But he’ll be headed to the 15-day DL, retroactive. He had the arthrogram. We don’t have the final results. But we have enough of the information that he is not going to be able to pitch for at least the next 15 days. So he’s going to go on the 15-day DL." The team later confirmed that Nola will be the one taking Billingsley's roster spot. Billingsley, who missed most of the last two seasons with elbow injuries, has a tingling sensation in his elbow, according to Amaro. "He’s got some tingling, which is obviously, probably a nerve issue, and he’s got a little tenderness in his flexor tendon," the GM said. "We’re still waiting on the final diagnosis of the MRI. It’s unfortunate. He’s worked his rear end off to get back to the point where he’s pitching in the big leagues again. It’s unfortunate that he’s not able to do that anymore, at least right now." The GM also said there is a concern that the injury could be season-ending. And at this point, one has to wonder if Billingsley's latest setback could be career threatening. In positive injury news -- is that even a thing? -- Amaro did say that injured starters Aaron Harang and Jerome Williams are progressing and could return to the rotation soon. "Harang obviously did four up-and-downs today, and I think the next step for him is to probably throw in another rehab game," Amaro said. "But we’ll see how he comes out of this from his plantar fasciitis in his left foot." A few minutes later, interim manager Pete Mackanin had an update following Harang's simulated start. "I didn't see the whole practice," Mackanin said. "But he threw 80 pitches and I think [pitching coach Bob McClure] said he only missed his spot seven or eight times which is outstanding. I know it's just batting practice, live BP, but that's a good indication that he's back on track." Meanwhile, Amaro said that Williams, who has been sidelined for a month after injuring his hamstring covering home plate, is healthy enough to return. "Jerome is probably ready to go," Amaro said. "We believe he will be activated sometime soon. We’re still discussing it. But we believe he is ready to go." After the game, the Phillies made good on Amaro's word, activating Williams from the DL. In a somewhat surprising move, the team optioned David Buchanan, the winning pitcher on Monday night, to triple-A Lehigh Valley. According to Mackanin, that's so Buchanan can continue to pitch on a regular five-day schedule. With the Phillies having off days on Thursday and Monday, they're able to skip a few spots in what seems like an ever-changing starting rotation. Chase Utley has been the focus of much debate among Phillies fans. On the field, he was struggling mightily prior to his latest trip to the disabled list. Off the field, there's been talk of him not being the everyday second baseman upon his return -- including from his GM -- and whether or not his vesting option* has anything to do with why 25-year-old Cesar Hernandez could be the guy at second going forward. *Utley is due $15 million next season if he reaches 500 plate appearances. He is currently at 249 for the year. On Monday, Amaro said the decision on who plays second base upon Utley's return is completely up to Mackanin. He also offered an update on the 36-year-old's health. "Chase, as you can see, is doing more baseball activities," Amaro said. "So he has increased some baseball activities. We hope that within the next week or so, depending on how the progressions continue, that he’ll get a chance to go a rehab and play some games and maybe get some reps defensively." Amaro also spoke about Jonathan Papelbon's most recent comments while offering some updates -- or lack thereof -- regarding the July 31 trade deadline. "Well, we have had a lot of active discussions the last few weeks actually," Amaro said. "And I think they will continue to pick up. Just like every July 31st, there’s activity. There will be more activity as you get closer and closer." Like I said, not much there. However, the Phillies GM did say that he wasn't bothered by his closer's comments over the all-star break and believes that Papelbon won't be a problem in the clubhouse if they are unable to trade him before the deadline. "He’s a professional," Amaro said when asked why he didn't anticipate any issues. "He’ll go about his business. And when he gets on the mound he’ll be competing just as he normally does. I don’t think that’s going to change the guy who’s on the mound. Whatever uniform he puts on, he’ll be competing." The other Phillies pitcher who has been the subject of recent trade talks, Cole Hamels, has struggled mightily in his last two starts, allowing 14 combined runs in just 6.1 innings of work. And while Amaro doesn't believe that will impact his value -- he thinks Hamel's track record speaks for itself -- he does believe all the trade talk could be affecting the 31-year-old lefty. "You’d probably have to talk to [Hamels] about that," Amaro said as a qualifier. "He’s a human being. There’s a lot of distractions. There’s a lot of talk about him in particular. As we said before, these are human beings. Could it affect him? Sure. He could also just be going through a spell right now where he’s not pitching his finest. He’s still one of the best pitchers in baseball, I think. One of the best left-handed starters." Will we see Cliff Lee this season? The answer to that is still very much up in the air, at least according to Amaro. "Cliff’s been diagnosed and right now I’m in the process of seeing what the next step is," Amaro said. "He’s feeling okay... He’s been fine doing his work. Hasn’t thrown yet, but probably will be throwing by the end of this month. And we’ll see how he feels once he’s doing that. "I just don’t know whether he’s going to be able to, at this stage of the game, get ramped up to be able to throw after not having thrown for so long." Amaro, who added that the team is in no rush to get him back on the field this year, said they will go on Lee's timeline instead, based on his health and how he feels. Does that timeline involve him returning to the rotation this season? "I don’t know. I haven’t talked to him directly," Amaro said. "I’ve talked to his agent a little bit. I really don’t what the answer is."